Younique now has 19 shades of Liquid foundation including 6 brand new colors that just launched. 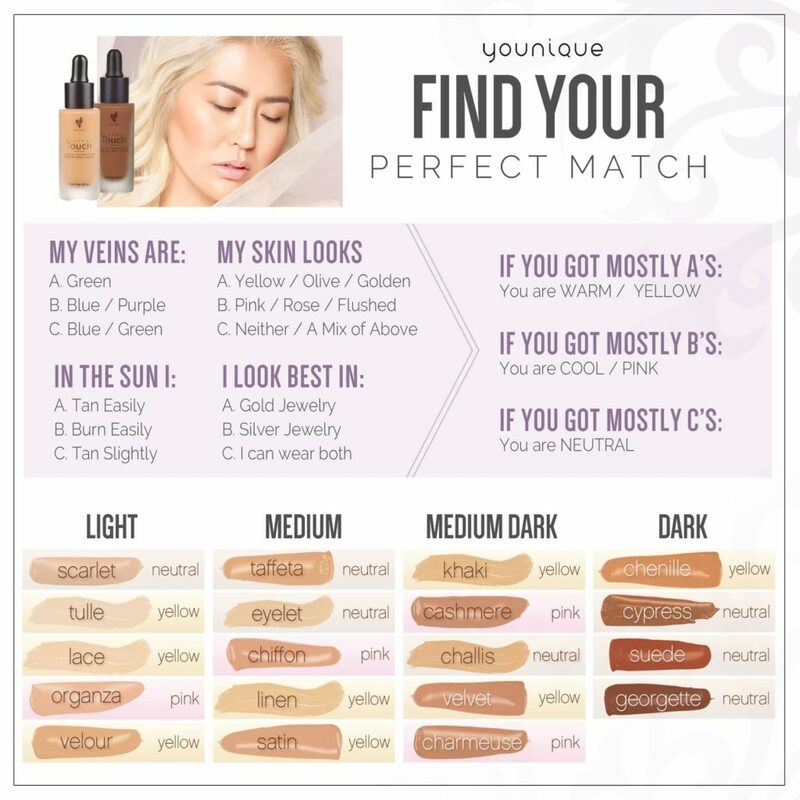 Younique Foundation Color matching can seem overwhelming but it really doesn’t have to be and now with the addition of these new colors you are more likely than ever to be able to find the perfect match. If you need help with color matching email youniquelyaudrey@gmail.com and I will help you. As you look at this chart you will notice each color has either (warm) (neutral) or (cool) underneath it. This indicates the undertone type for each color. Warn is often known as the yellow undertone, this usually describes somebody who easily tans in the sun and has green veins in their wrist. They often look best in gold colored jewelry as opposed to silver and look good in brown colored clothes. Neutral is kind of an olive undertone and describes people who might burn in the sun but then it fades to a tan, they look good in both gold or silver jewelry, they can wear brown or gray colors and they have bluish green veins in their wrist. Cool is what we call pink or reddish undertones, people with cool undertones burn easily in the sun and can’t usually tan, they look good in silver jewelry and gray colored clothes. Cool undertones have blue or purple veins in their wrist. Most redheads are cool toned as well. 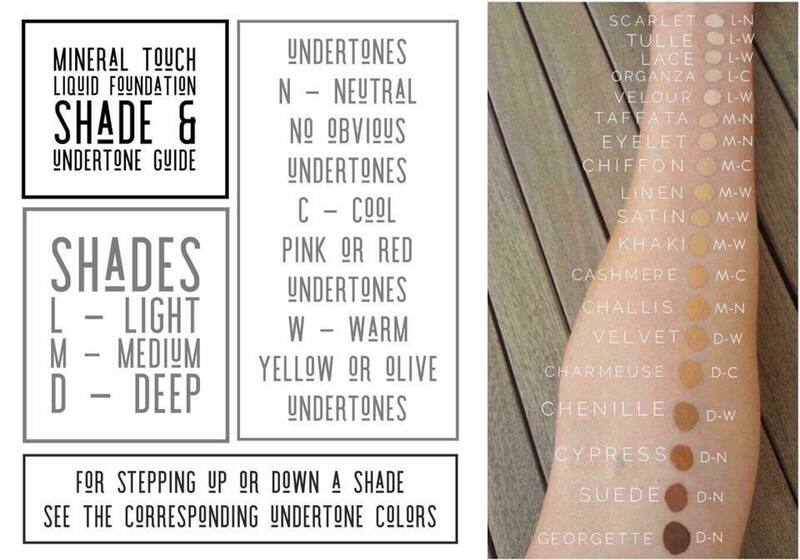 Once you know your undertones, it is much easier to color match, based on the information above you should have a good idea of the colors that may be a good match for you and your undertones. Here are some swatches of all 19 Younique Liquid Foundation colors to show you more closely what they look like. Buying Younique Liquid Foundation online doesn’t have to be intimidation and it is ok if you still do not know which color you need. Send me an email at youniquelyaudrey@gmail.com and I will help you through color matching or you can send me a message on facebook here https://www.facebook.com/YouniqueByAudreyH/ and I will help you ASAP. 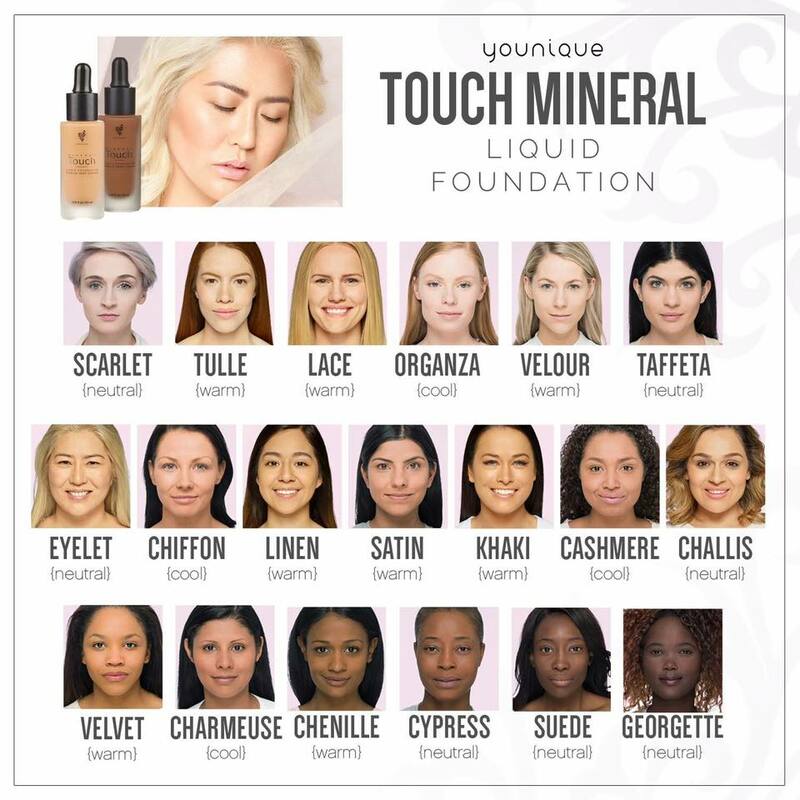 If you do feel confident in your color match you can buy Younique Liquid Foundation at the link below for $39 USD. Last but not least with Younique’s Love It Guarantee ,you don’t have to worry about making the wrong choice.